The ML910 Rugged Notebook is designed to meet the requirements of military and public safety users and built to excel in tough environments. Optimized for secure and reliable wireless communications, the ML910 Rugged Notebook features the first 13.3â€ widescreen display providing higher resolution and more space to view multiple applications than other rugged notebooks in its class. 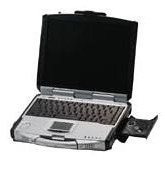 The ML910 Rugged Notebook continues the Motorola heritage of offering fingerprint authentication as a standard feature. Note: At this time (March 21, 2007), this appears related to the Motorola MW810. We will update this page as more details become available. Graphics: – ATI Radeon X1400 with 128MB video memory + video capture features. * ML910 has a hard drive heater for operation in freezing temperatures, plus internal monitoring to prevent problems with extreme heat or cold.